So when I saw Kelis' spread via the FashionBombDaily, I knew this was something that I wanted to recreate. I've been a fan of hers since high school. She has been a huge influence and trend setter in the music world. Ahhh hem! Anyone remember the "Bossy" video haircut? The one that made a certain other female pop star, in my opinion, famous. I'm not saying, but I'm just saying. I think that hair cut, has done wonders for a lot of these songstresses' careers. Yes, that may have been a little messy, but I like to make sure I give credit where credit is due. Anyways, Kelis I've always recognized your uniqueness and fabulosity...and yes you were the first girl to scream on the track. I love being a fashion blogger, but there are times like these where I just can't believe I get to wear such wonderful things. 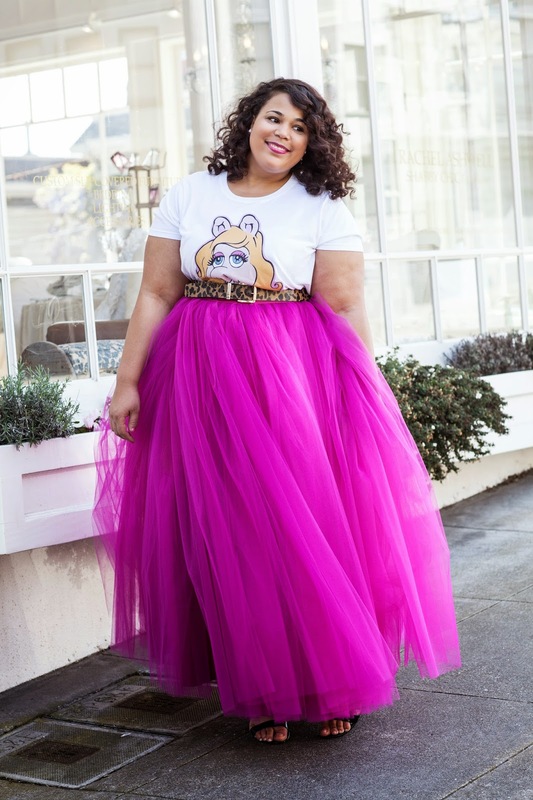 There's something about a tulle skirt that is magical and fun. I was taking these photos and ran into a school of 5 year old ballerinas and they couldn't take their eyes off of my skirt. It was the cutest thing. I know my niece, Kylea, is going to love this look. Sometimes, regardless of age, it's a good thing to feel like a princess for a day. 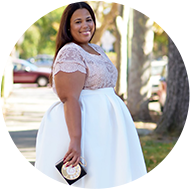 Style Notes: I want to give out a huge thank you to etsy designer, Fanfaronada and Custom-Plus. Fanfaronada has a shop full of tulle skirts in various lengths and dreamy colors. I did request this one in a custom length and color. For special request such as this, hit the "request custom order" button on her page. 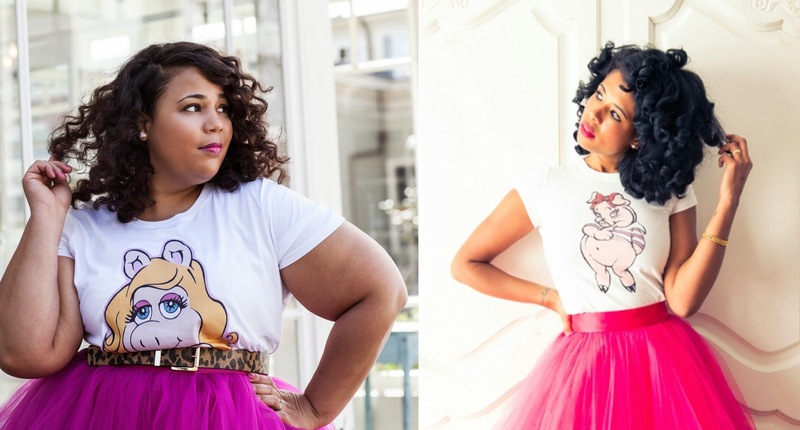 Last but not least, Custom-Plus does the most awesome printed plus size tees. I opted for this Miss Piggy tee, since she's my girl and all. Ha! Anyways, they fit well and and are made of a soft cotton. I got the xxl in this one. LOVE ! You look amazing !!! You Look.....yummy! U totally rocked the look. Wow! I'm totally in Love! love the look! The hairstyle is fantastic!!! Oh my gosh! You look amazing!! That skirt is fabulous! Such a fun outfit!!! This is perfection!!!!! Seriously you look perfect! Im home sick today and seeing this outfit made me smile. Adorable. Ahhh I'm sorry to hear that. I know how that is!! I'm glad this could brighten up your day...LOL. Who can say no to a pink ballerina skirt?!? I've been looking for one of these to wear to my daughter's party. It's beautiful. . This skirt is gorgeous! Heck you're gorgeous! This look is absolutely fabulous! I scour Etsy frequently for tulle skirts. I love this full length and the bright fuschia color. It's getting me to think outside of my knee-length, neutral/pastel box. I love the pairing with a graphic tee and leopard belt. It makes the outfit fun and whimsical instead of too sweet or glamorous for daywear. Love it! Nicely done! You look amazing. Beautiful, beautiful skirt. And, yes, Rihanna happily snatched Kelis' "Bossy" haircut and made it her 'own'. Blah. Girl my husband gave up on me years ago LOLOL...I let him wear what he wants and he lets me wear what I want. Wow! I want your whole outfit! I never go anywhere to wear anything as fabulous! Not often I like tule, but you are really rocking it! I dare say better than Kellis. Everything about your look is Amazing! i love kelis also what a great outfit to dress up in. sooooo cute indeed. you have sources indeed. You know you be gorgeous girl! I love it!!!!! Where would you rock this look? Dinner? Concert? can you tell me if the skirt is made out of a soft or course Tulle? It's traditional tulle...so I guess it's coarse. I would get one to wear to a photo shoot for puctures:-) or even a Christmas part! omg what is so funny i had this on my list of things to recreate lol you have done it so well and i love it! Thanks love! I had a couple people say that. It was too much a fun look not to recreate. Chasity hunnnty! You look amazeballs! I LOVE THIS!!!! So much that I can't put it into better words! Kelis has always been a trendsetter but sooooo many folks sleep on her style. They do and thank you! P.S. 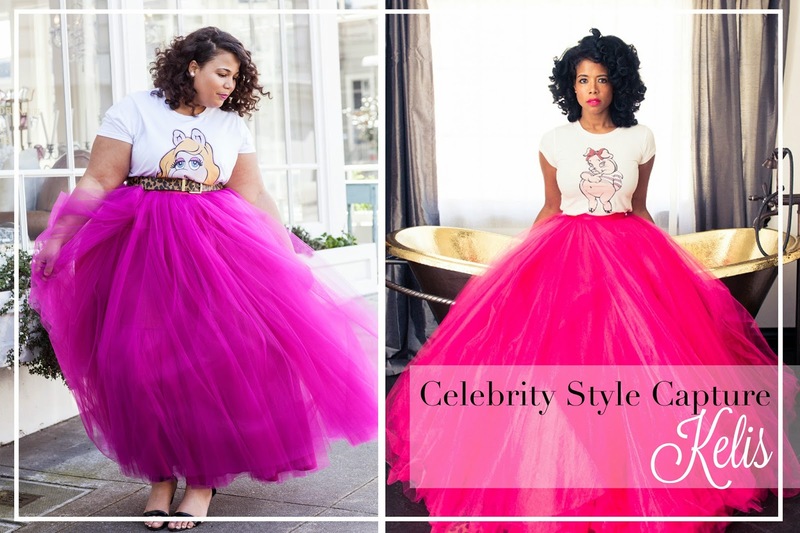 You look AMAZING and you get infinity props for this outfit (Miss Piggy ❤️ + Kelis + a bright pink tulle skirt)!!! killed it! I love it! the color on you is just perfection. Nice one, I really like it. love your pic. we're using it as inspiration for my daughter's sixth grade prom outfit. Thanks! again another successful look! i love the skirt it has the most amazing color! You look absolutely stunnig!!!!! I love Fanfaronada skirts too :-) Very, very cool!!!! You look absolutely fun, flirty and fantastic! This is so cute....I wish I had this for the Ty Tribett concert this weekend! Gorgeous! Where did you get the tutu your wearing ...absolutely lovely ??? Hi , thank you for sharing bc I absolutely love kelis and I wanted this skirt. I am an esty buyer bc I just had a baby girl and I have a few tutus for her I ordered from esty. I will purchase this tulle for myself. What length is your custom? You rock, love the look. Love the look. Gonna copy. Thank you! Got the shirt but I was wondering do you have any alternatives for less pricey skirt but in that color (it doesn't have to be tulle) and where'd you get that belt! To me this is one of your best outfits; it's just so pretty. I have a keen interest in entertainment news. I feel as if the stuff of Hollywood gossip is the stuff of dreams and it makes me escape the grip of reality.